The teeth are used to bite and chew food every day. While some foods are soft, many are hard and sticky, which can place a great deal of force on the teeth. Over time, the teeth may weaken, especially if a person practices poor dental habits, such as nail biting or teeth grinding. When a tooth has weakened, it is more susceptible to minor chips, cracks, or fractures. Although a small chip may not impact a person’s oral function, it can compromise the appearance of the smile. Porcelain veneers conceal a wide range of aesthetic flaws, including chipped teeth, to enhance the beauty of the smile. Dr. Byron W. Wall is happy to offer porcelain veneers for chipped teeth at his Albuquerque, NM, dental practice. These restorations allow his patients to restore an attractive, healthy-looking smile. Porcelain veneers are one of the most versatile cosmetic dentistry treatments, and are suitable for patients with a variety of cosmetic concerns. Porcelain veneers are commonly placed to conceal chipped teeth. As long as a chip is not too severe, porcelain veneers should be an appropriate treatment. Veneers are especially well-suited to patients who have additional cosmetic concerns. For example, with one application, porcelain veneers do not just address a chipped tooth, but can also improve tooth color, correct minor spacing issues, and create a more uniform smile. Patients should note that, if a chip is large enough to compromise the strength of the tooth, or if the chip exposes the sensitive inner layers of the tooth, restorative dentistry treatment may be needed. Dr. Wall is happy to perform an examination and let patients know if porcelain veneers are the best treatment option after suffering from chipped teeth. Porcelain veneers treatment typically requires two dental appointments that will be spaced a couple of weeks. The initial appointment allows Dr. Wall to design a set of veneers that will best complement each patient’s smile, as well as prepare the teeth for porcelain veneers placement. 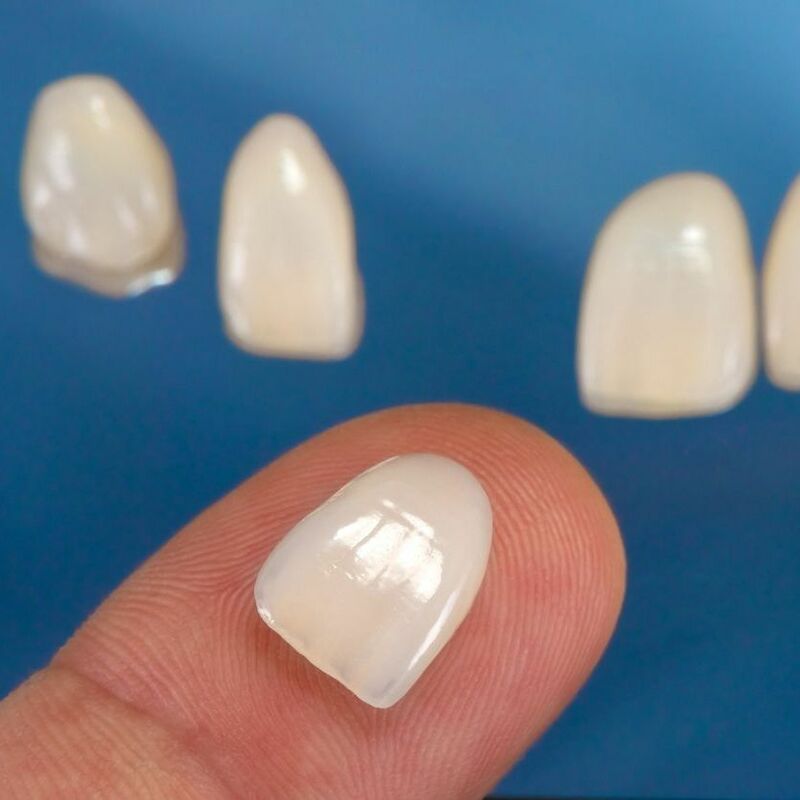 When planning each set of veneers, Dr. Wall will take into consideration the shape, size, and color of adjacent teeth. He will also consider the patient’s facial features and proportions. To ensure that porcelain veneers fit properly and sit flush with the natural teeth, Dr. Wall will need to prepare the teeth that will be treated with veneers. Dr. Wall preps these teeth by removing a small amount of enamel. The amount of enamel that is removed is minimal, but it will leave the teeth vulnerable, so you will permanently require the protection of porcelain veneers. After preparing the teeth and taking molds that will be used to fabricate the final set of veneers, Dr. Wall will place temporary restorations. These will protect the teeth while we wait for the patient’s porcelain veneers to be completed. The final stage of porcelain veneers treatment is completed at the second dental appointment. We will schedule this appointment after the permanent veneers have arrived at our office. After testing the veneers for fit and comfort, they will be bonded to the teeth. We use a dental compound to place the veneers and then harden the material with a special dental light. Once the porcelain veneers are in place, they will protect the teeth and improve the appearance of the smile for up to ten to fifteen years. If your teeth are chipped or suffer from other cosmetic imperfections, you may be an ideal candidate for porcelain veneers. Contact us at your earliest convenience to learn how these restorations can enhance the natural beauty of your smile. Dr. Byron W. Wall and his dental team look forward to hearing from you!